I’m a birder and a nature enthusiast and thus never travel without binoculars. Unfortunately I also enjoy photography and dislike checking luggage. So I’m left with the dilemma of what to bring – gear or clothing? I began birding with a pair of binos from my mother, ca. 1940. They were a bit scratched and very heavy. So, despite the sentimental value, I put these aside for a reasonably priced Leupold model – the Leupold Yosemite. When the kids were out of college and we’d freed up money for travel, I invested in a Vortex Talon. Love these binoculars! Fast forward two years to a Christmas morning when I was surprised with the Swarovski CL companion binoculars. These are now my go-to travel binoculars. Compact but with Swarovski optics. Budget – unfortunately this is probably the biggest factor in buying binoculars. The high-end optics are ridiculously expensive. And not necessary for most people. Use – are you a birder, a sports person, or just like to get a close view of vistas while traveling? Theater buffs – no need for the high magnification, 4x to 8x is sufficient. Look for a compact model so as not to annoy your neighbors. Hiking or general outdoor use – you might want to focus on durability and waterproofing. 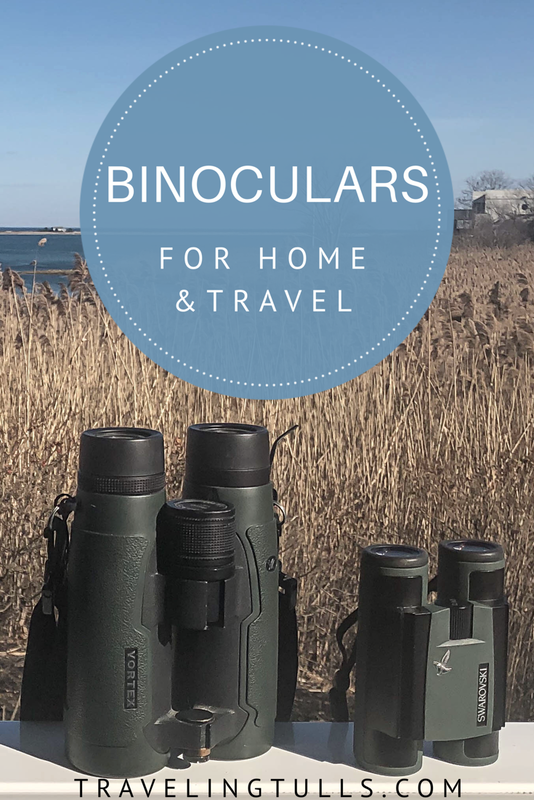 Travel style – where are you planning on taking your binoculars and how do you pack? If you visit big cities primarily, you likely don’t need high magnification in your binoculars. Visiting the National Parks, you might want those long lenses. If you pack carry-on, then space is a premium – look for compact binoculars. Going on a world cruise with a steamer trunk, get full-sized binoculars to be the first to see land! There are many factors in categorizing binoculars, but1 for the general population, these two – Magnification and Lens Diameter, and Field of View are probably the easiest to understand and use in choosing a set. For more detailed information see the REI guide. Magnification and Lens Diameter – each set of binoculars has two identifying number (8 x 25, 10 x 30, etc.) The first number is the magnification number – how much closer you can see than with the naked eye. The second is the size of the objective lens. This number is important as the diameter of the lens determines how much light gets to your eyes and thus makes a brighter view. Field of View – FOV – width of what you can see from a distance of 1000 yards. If you’re examining the ceiling of Pantheon, you won’t need as wide a Field of View as if you are trying to find a bird in the bush or follow a soccer ball down field. Leupold Yosemite 8×30 – these are rugged, easy to use binoculars. They are smaller than some and fit well into smaller hands. I keep these in my car and use these with my grandchildren. * These are a fantastic option for basic binoculars, good optics at a reasonable price. Leupold Yosemite 8×30, 1.7 lbs, FOV 389 ft.
Vortex Talon 10×42 (newer model – Vortex Viper 10×50) – great optics for birding. Waterproof, durable and with Vortex’ great customer service, these lenses are my at home basics – always ready for an interesting bird. These are heavy at almost 3 lbs, so not best for lightweight travel, but I never regretted carrying them in Egypt and Africa. Vortex Viper 10×50, 2.95 lbs, FOV 341 ft.
Swarovski CL Companion 8×30 – Exceptional quality in a compact size. These binoculars are a joy to use – focus is fast and easy, and the image is amazing. The size allows for us to include them in any trip – they’ll be rafting the Colorado with us this June before heading to the Serengeti in September. Only caveat is that these binoculars do not come with lens caps. Be sure to keep them protected from damage. Swarovski CL Companion 8×30, 17 oz., FOV 396 ft. These are the binoculars used by the Beach Ambassadors, our local family nature program. Posted on February 5, 2019 February 28, 2019 by TravelingTullsPosted in Gear and Gadgets, Pack for Adventure, ReviewsTagged Audubon, binoculars, birding, birds, kids binoculars, Leupold optics, nature travel, optics for travel, safari, Swarovski optics, travel binoculars.